Saizou – the Piggy – Pattern! Posted byKatta	 April 7, 2014 April 7, 2014 Leave a comment on Saizou – the Piggy – Pattern! Initially, I thought I’d work my way through some pig pattern, but then I modified it so heavily, that the new pattern calls for publication. 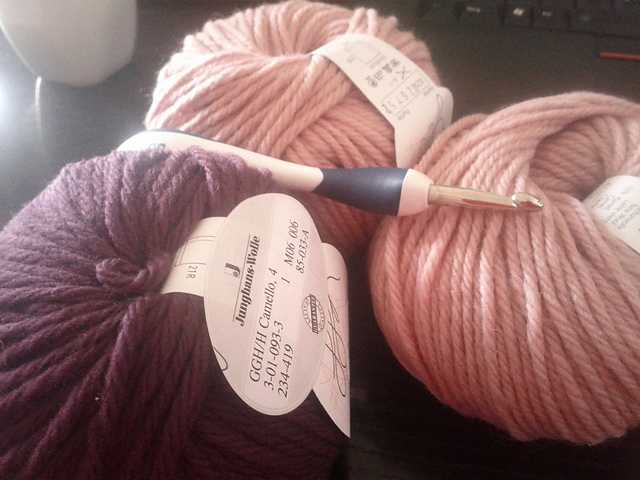 I used bulky yarn (GGH Camello in pink (3 skeins) and dark purple (1 skein)) and a 6mm crochet needle. You will also need some white, some pink and some dark pink felt, some thicker scrap wool in black and an aluminum string. Little tools you might want to have handy are scissors, glue and a tapestry needle. Additionally you will need lots and lots of polyfill. The pig will be so large, you can use it as a cushion. 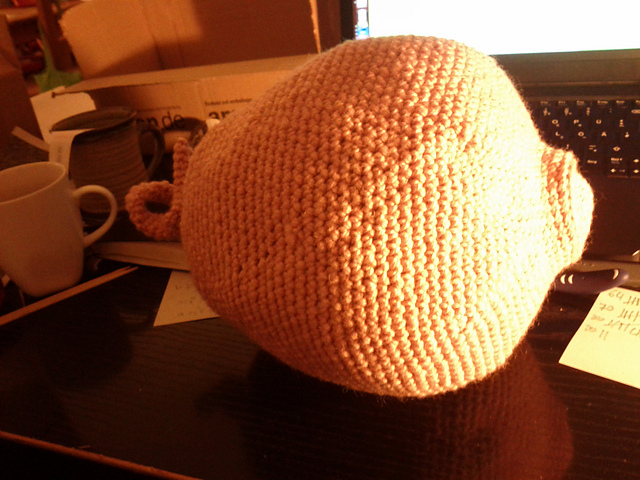 A combination of thinner yarns and smaller needles is of course possible to resize the piggy. Continue increasing in the fashion of the last two rows until you have a total of 98 stitches. Then sc around for about 5 rows. Decrease in that fashion five more times (42). During the following rows you should continue decreasing like you did before in every row and stuff continually, so that you have a fit tight enough for shaping but soft enough for cuddling. When you are down to six stitches per row, crochet 20 times around in sc. Fasten of. Insert the aluminum tube into the tail and twirl it. 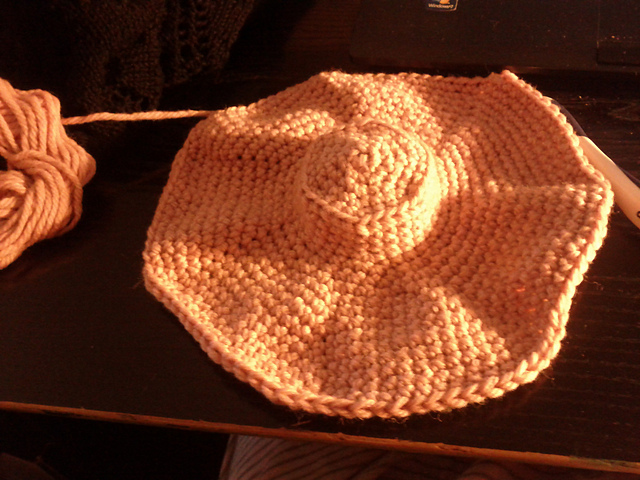 With dark purple yarn create a ring (like before). Fasten off and stuff lightly. Stuff horns and fasten off. 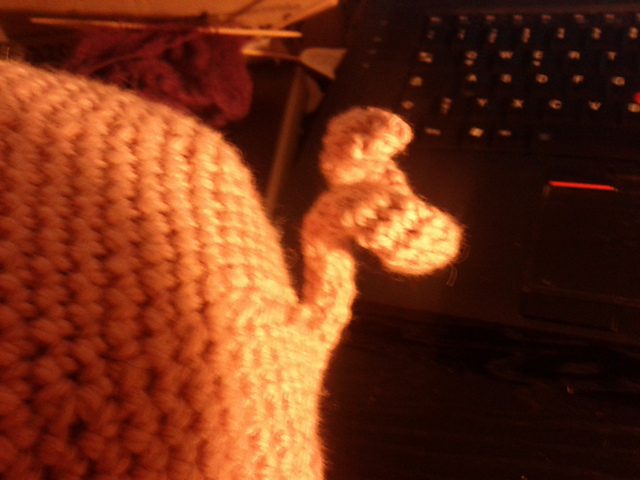 Sew feet/hoofs and horns on the piggy. Cut out the felt and glue white part of eyes and snout on the piggy. 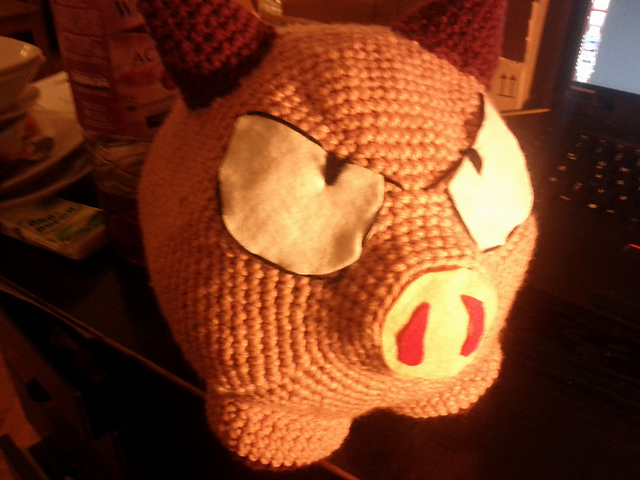 With black yarn, use tapestry needle to accentuate piggy.